Certainly one of the tougher questions to decide upon when buying jewelry is what size stone would look best? Towards this end, we are starting to do a series of new photos to show you how relative diamond sizes compare while on a model's hand. Note, that for rings, 1.5ct is by far the most popular size. We've only completed the first photo for the rounds, but are planning to try and do a similar photo for the various cuts we offer such as princess, cushion etc., and do them for both rings and earrings (on an earlobe). This will take some time, as we have to not only set a series of rings or earrings, but also shoot the photos, etc. We do hope that this type of unique perspective will help you decide what would look best for you to purchase! 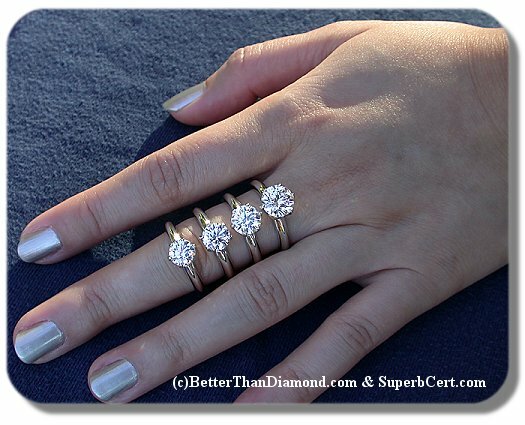 Sizes: From left to right: 1.02ct, 1.21ct, 1.51ct, and 2.01ct. Note: Model's middle finger is a 6 US ring size (used to try and fit more rings on the upper knuckle).